CELEBRITY APPRENTICE: Contestants’ Craziest Season! During a conference call this week with Donald Trump and two of this season’s celebrity contestants, NeNe Leakes, and Meatloaf, Trump committed to the statement – “I believe it’s the greatest group assembled for a reality show” referring to the new season of “The Celebrity Apprentice” premiering on NBC this Sunday, March 6. The current promos airing on NBC creating buzz for the show, repeatedly refers to this season as “crazy”. Well, as Trump attested during the call, it’s not just buzz. He also refers to the new season as “crazy”. So crazy in fact, he stated that things got so heated during a moment with the men, that Trump said he had to “sneak out of the room and had to call the police”. Yes, the police!! Meatloaf stated that producers of the show repeatedly kept placing him in the same car with other celebrity contestant Richard Hatch – best known for cruising naked on the “Survivor” Season One island. Meatloaf said that he kept “winding” Hatch up because he didn’t think he would like him at first. However, based on Hatch’s friends, he changed his mind. NeNe Leakes attested to coming out of “The Celebrity Apprentice” with some good friends and some enemies. One particular said enemy which was leaked early-on in filming to online press, her feud with Star Jones. Leakes responded “Star has it in for me”. Trump interjected with “Star will NEVER love NeNe”. Leakes stated “I’m okay with it! A lot of people don’t like Star. So, I’m not the only one that doesn’t like Star”. Leakes also commented on “The Celebrity Apprentice” rigorous filming schedule. She said that she went there straight from “Real Housewives of Atlanta”. “The schedule was hard. Everyone was getting sick”. It’s all well worth it. Trump stated that he prefers shooting “The Celebrity Apprentice” shows over the “The Apprentice” ones. Due to the fact that the viewership is already there. Audiences don’t have to watch for weeks to get to know contestants like they do with “The Apprentice” shows. “I just like the celebrity concept better” said Trump. One celebrity Trump said that he’d like to have on the show is Charile Sheen. “While I’m sure we won’t get him on ‘Celebrity Apprentice’, we would love to have him”, he said. Viewers of the premiere episode will see Sunday night, the first firing. Trump stated that this particular firing was “a tough thing to do. It was sad. It was very very sad”. The full cast of celebrities this season competing for the number one celeb apprentice title and money for their charities are: La Toya Jackson, Mark McGrath, Star Jones, Lisa Rinna, Dionne Warwick, Richard Hatch, Jose Canseco, Niki Taylor, Meatloaf, Marlee Matlin, David Cassidy, Hope Dworaczyk, Lil John, Gary Busey, NeNe Leakes, and John Rich. 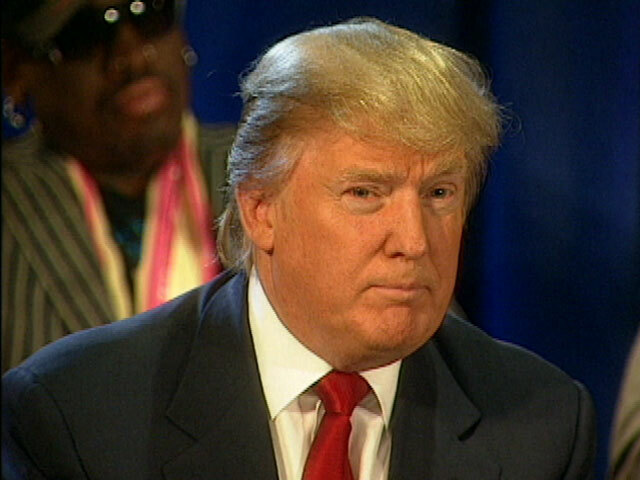 Tune-in to “The Celebrity Apprentice” Sunday, Mach 6th at 9pm EST/PST on NBC.